It’s been drizzling rain here Denver for about 6 days now. Our seasons usually casually slide into each other, but this year summer abruptly clicked into fall. This may be the first year that I don’t have post-summer blues. Perhaps it’s because it’s the first year that I’m not returning to school or teaching, as I have for the past 30 years of my life. I went from college right into teaching first grade. No, this year I’m excited for fall, and fall cooking. Nothing could be more fall than chile. How do you spell chile by the way? Is it chilli? White chicken chile is not anything new. But it is delicious. I typically don’t like the “white” version of things, chocolate, pizza. But this is good. Lick your bowl good. I’m currently experimenting with not eating dairy for various reasons (yeah, it’s sad). You could easily make this without the cream cheese. Please only do so if you have to! It’s quite the cheater recipe in that gets a lot of its seasoning and flavor from the prepared enchilada sauce (So “semi-homemade” cooking of me, but no I won’t do a “table scape”). This helps to make it a super easy week night meal that should only take about 30 minutes. Heat a large pot with a little oil over medium high heat. Add the ground chicken and let it sear for a bit before you move it. You want it to get brown. Don’t stir it around too much. You can break it up later. Browning makes flavor. Once the chicken is cooked through and browned, remove it and set it aside. Add the chopped onion to the browned bits left in the pot from the chicken. Add a little more oil if you need to. Cook the onion about 4-5 minutes until soft. Add the garlic and cook for about 30 seconds-1 minute. Add the smoked paprika, some salt and pepper and cook for about 30 seconds. Add in the beans, cream cheese, chicken broth, enchilada sauce, and green chiles. Cook over medium heat until the cheese is melted. Return the chicken to the pot and simmer for about 10 minutes. Serve the chicken chile with cilantro, tortilla chips, sour cream, lime wedges, and avocado. *My husband loved this chile. I thought it wasn’t creative enough or special enough for a blog but he said “why not?”. So, I hope you feel the same way. Let me know in the comments below what you think and especially if you try this! Roasted chicken has always been one of my favorite things. Skin on, bone in. They both give so much flavor. Remember when everyone was in love with boneless, skinless, breasts? Many still are. I’m going to be bold and say that I am 100% team thigh. They’re so juicy and flavorful and harder to overcook. This recipe is one of my favorite weeknight recipes because you can prep it the night before or in the morning. I love all the briny, fermented, umami goodness that preserved lemons bring, but you could easily use fresh lemons. Olives continue the briny goodness. Buy some good black and or green olives at the olive bar. If I buy a whole jar of olives they almost always go to waste. I love the olive bar because I can buy just 5 olives if I want to. I highly recommend buying olives with the pits still in. Similar to how bone in meat has more flavor, unpitted olives are more flavorful than pitted. Onions finish off this dish adding a sweetness quality after they have been cooked down and soaked up all the delicious chicken drippings. Preheat the oven to 400 degrees. Rinse and pat dry the chicken. Sprinkle both sides with plenty of salt and pepper. Place in a 9×13 baking dish. Arange the sliced lemon and onion evenly all around the chicken. Sprinkle on the olives. Pour the avocado oil over everything. Put into the pre-heated oven and roast for about 50 min. You’ll want the skin to be crispy. If it doesn’t crisp up to your liking, a couple of tricks are pouring a little more olive over the skin before it’s done cooking, or turning the oven to broil and broiling it for a couple of minutes. But don’t ever leave a broiling oven! I have a friend who takes this so seriously that she just sits in front of the oven, face close to the window, the entire time she broils. Take it out of the oven and let it sit a couple minutes. Serve it with rice, quinoa, or Israeli couscous. 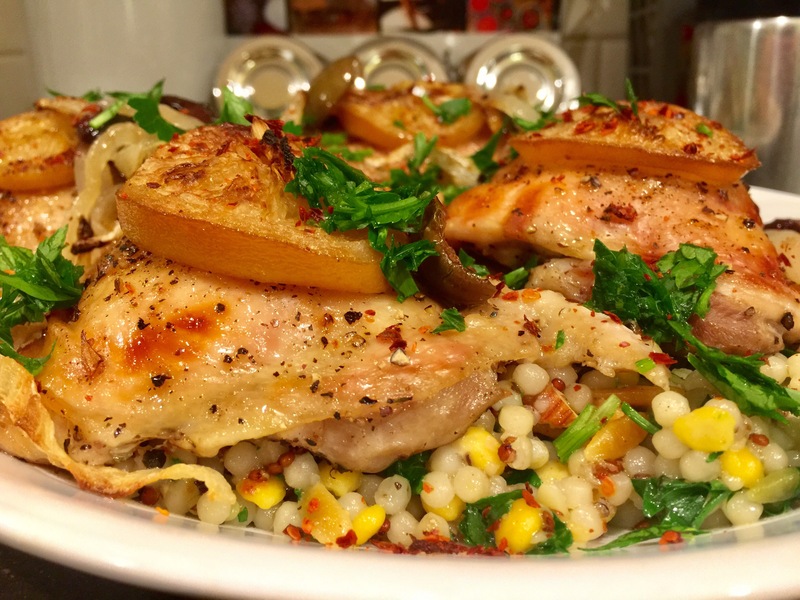 I served it with my favorite little grain blend, Trader Joe’s Harvest Grains. There is a great description of it on this blog. I cooked the grains according to the package, chopped up about 2 Tablespoons of almonds and a 1/4 cup of parsley. After the grains were cooked, I poured in a couple of tablespoons of extra virgin olive oil, seasoned with salt and pepper and added the chopped almonds and parsley. I spread the grain mixture on a large platter and arranged the chicken dish over the top. Then I sprinkled everything with more parsley and a little Aleppo Pepper Enjoy!